It's my policy to be open and forthright about products I review and endorse; so it goes like this... Patrick, from Grubbly Farms wrote me an email offering to send ChickenBlog a bag of black soldier fly larvae for our chickens in exchange for mention on our blog. I read about them, I read about the flies, and I found that Grubbly Farms not only have a good sounding product, but a compelling story, as well; so I decided to let our chickens give the Grubblies a try. Would your chickens like to give Grubblies a try? We might have some to share... leave a comment. Our poor hens have been cooped up quite a bit, lately, and I've been concerned about them missing out on the wider range of foods they can normally get at when they free range. Chickens are quite omnivorous... it's what makes home-farmed eggs healthier and tastier than most found in markets. I won't use these larvae as a meal... more as a treat, or a bribe. And I am happy to say, the Grubblies were such a big hit, I can count on them to be a great incentive for bringing my girls home to roost when we want them in before dark. They come neatly packaged in a resealable bag. Not gross! I just wanted to assure you that there was nothing stinky, slimy, or off-putting about the dried larvae. I had Liberty, Thompson, Mako, and Koa eating out of my hand in no time. All the hens were Grubbly fans once they saw that their sisters were into them. Okay... full disclosure: I took 117 pictures, just so I could try to capture both the product and the enthusiastic hens. I can tell you, the product is great, the hens love it, but photographing chickens doing a product endorsement? Not as easy as I'd hoped! Hopefully, you get the idea! Here are Patrick and Sean, the enterprising young men who started Grubbly Farms in the laundry room of their downtown Atlanta apartment building. Larvae in a laundry room? This is a great startup story! I'm glad they are getting good press, like this interview with Popular Science, because not only do our chickens appreciate the healthy snacks Grubbly Farms sent them, but we really appreciate the idea of taking "waste," like the tons of food scraps that normally get dumped into landfills, and making something productive and sustainable from it. High protein food for fish and poultry, and rich compost for gardens, and produced in the United States! Jobs, environmental mindfulness, innovation, sustainability... this is inspiring stuff! If we are to have a healthy future, then this is the kind of innovation we need! Thank you, Patrick and Sean. Thank you, Grubbly Farms! Well, I think you did a great job with the pictures. I think I will order some. Oh! Thank you. 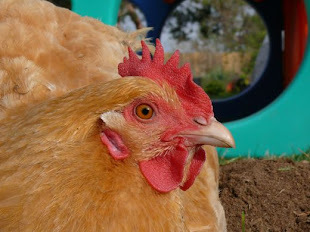 You definitely have the knack for getting your hens to look good in pictures! I found you via Posie gets Cozy. I've known a couple of folks that have a system to make their own black soldier fly larva, but this dried version would have a lot less of the ewww factor! I will check out their site for our chickies. Very nice to meet you, Laurie. Brave folks, raising their own flies... I think my hands are full enough just with the chickens, so what a relief to find someone else can help us with those treats, right?? I am hoping you blog, too... because I want to see your chickies!